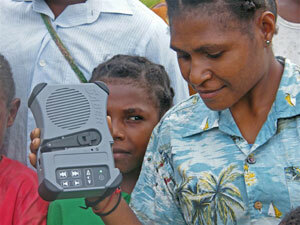 GRN audio-visual presentations include: "Good News", "Look, Listen & Live", and "The Living Christ". The scripts for these presentations are all stories from the Bible. They are not translations of the Bible, but they aim to simply and appropriately give the message of the Bible. The original scripts have virtually NO EXPLANATORY COMMENT. Why is this? It is because we want God's word to speak to the heart of the hearers. We want God to bring His message to those who listen. We do not want to get in the way or manipulate the outcome by assuming that we know exactly the message that God wants to give from the Bible story at any time. Interpretation of the Bible can be influenced by many factors such as theological background, world view, culture and present circumstances. This is NOT to say that the Bible does not communicate absolute truth or that every interpretation is equally valid. However, God may and does choose to bring different aspects of his message to different people at different times from the same story! In using this 'help document', it is important to realise that our goal is to help people hear God's message not to tell them what the message is or what conclusions they should draw from it. We want to help people open up the story and get inside it and to listen to God. As an aside, oral communicators are often better at drawing the important lessons from a story than those with western literacy based backgrounds. Even within one culture people learn differently. Some can learn from a book, others need to be shown. Some remember well what they hear. Others forget unless it is written down. Also methods of learning and communication vary considerably from culture to culture. In a traditional society a 'young' teacher may have very little credibility. This is not so in the West. In some cultures the older women may be the carriers of tradition. In another it will be the official story tellers. There are many questions to ask: "Can men teach women or vice versa? ", Can an individual express an opinion? ", "Who are the people of influence and power? ", "What style of communication is appropriate for different situations - songs, drama painting? ", "Can questions be used or is it not appropriate?" "Does the culture require you to always say you agree, even if you don't? ", to name just a few. Good teaching will involve understanding the learning and communication styles of the target people group. There is no "one size fits all" approach but there are broad principles that can be applied in many situations. If our primary goal is for people to hear, understand and respond to God's message, what can we do to facilitate this? This is spiritual work and the work of the Holy Spirit is essential if people are to be saved and grow in faith and knowledge of God. There are no short cuts here and no alternatives. Prayer is essential. Where possible start with creation, make connections to what is familiar in the target group. Don't try to cover too much material too quickly. If using the GN or LLL presentations, prepare in advance where the natural breaks occur so you can pause and interact. There is value in hearing the whole story at once as well as hearing it in instalments so let the 'audience' guide you. Ask them, "Would you like to hear more now or tomorrow?" Repeat the story, play it again, act it out, get them to tell the story back to you and even to explain it. Maybe get them to act the story. Use the Old Testament stories which demonstrate God's character and his plan. Don't introduce too much new material each time. If questions are appropriate try open questions such as these. They are non-directive and can be used with many many stories. This means you don't have to remember different questions for each story. What do you think some people may not like about the story? What character (if any) can you identify with the most? What kind of response, if any do you want to make to this story? Is there any question that you would like to ask about the story? Supplementary questions can be used to help them answer the above questions e.g. to help answer questions 5 (if you don't get much initial response) How did the crowd respond to Jesus healing the man with the withered hand? Why do you think they reacted like that? It may be appropriate to ask them if they have a story like this in their own culture. Get them to tell it to you. Ask them how it is different from the story you told? How would your village/family/life be different if the people followed Jesus teaching? How is the situation in this story like or unlike your own family or village? What do you think the character in this story should do? Why do you think God/Jesus said/did this? This is only an introductory guide. If you have found an approach which has proved helpful and effective, please share it with us. If you have made mistakes and think that others can learn from them, please share those too. Contact us on the Feedback Line.